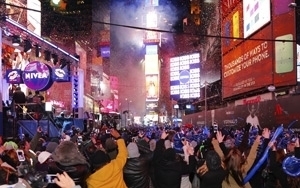 Californians have been doing it for years -- counting down to the new year on New York time. Now parents can fake the New Year's Eve countdown on Netflix. The company created a three-minute-long New Year’s Eve countdown program for kids whose parents want them to experience the countdown to 2015 without waiting until midnight. King Julien, star of DreamWorks Animation's All Hail King Julien on Netflix, will host his own Netflix special for kids that families can use to ring in 2015 whenever they choose to celebrate. The countdown becomes available in the U.S., Canada, Latin America, the U.K., Ireland, the Nordics, the Netherlands and France beginning Dec. 29, at Netflix.com/KingJulien. Julien ran with the idea after hearing that 36% of parents said they would search for a countdown in a different time zone to celebrate earlier, and 22% would stage a countdown of their own to get their kids to sleep at a decent hour. Here's a little trivia from KRC Research. The company conducted online research among 500 adults ages 18 and older. It turns out 73% of adults prefer to stay home New Year's Eve. Of those ringing in the New Year, 51% will kiss to celebrate the New Year, 33% will toast the New Year, 12% will ring it in with a song, 31% will hug to celebrate, and 27% will be asleep by the time the clock strikes midnight. About 63% of people will make New Year's resolutions. Some 31% will make a New Year's resolution to lose weight, 29% will make a New Year's resolution to relax more, and 21% will make a New Year's resolution to go on a budget. Some of the 2015 predictions based on Bing search engine results include an increase in travel to small towns across America, while metropolitan cities like New York and Los Angeles will fall off the list. There's also a spike in interest for Middle Eastern food, from dishes they want to try at home to restaurants they plan to visit. How will you ring in the New Year? Happy New Year! Be safe. See you back here in 2015.